Are you a salesperson who is always scanning the sales landscape for ways to improve? Do you tend to your sales motivation with great care, never forgetting that you are indeed responsible for your level of success? My guess is that the below 33 tips will resonate with you! Leaving voice mail messages is not a the best way to develop new customers, but it is a great way to keep in contact with those customers with whom you already have a relationship (but may not deal with on a frequent basis). The entire process takes less than 5 minutes per day, preferably between 6:45 a.m. and 8 a.m. Calling people at this time shows you are driven. Understandably, people are often away from their desk at this time, so you would be able to make 3-5 calls in the span of only 5 minutes. Great way to build momentum for the day. Your big objective here is to not let the person you’re contacting forget about you. The way you do this is by merely stating that you haven’t heard from them lately. You can compliment them on their business or simply suggest that the two of you should talk later. Should you reach someone at this time of morning, all the better. The person you reach live will be impressed that you’re also at work before most people, and chances are the person will talk for at least a minute. Remember, the objective is not to sell anything — it’s simply to raise the other person’s awareness of you, thereby opening the door for future sales. Every time you’re with a customer, make it a point to learn something personal and professional about them. Don’t allow your time together to be so focused on the immediate business opportunity that you miss out on additional, long-term information. It’s the long- term information you gain that will help you retain the customer, and the longer you have a customer, the more likely they are to refer others to you. When you’re gathering information about the person, look for items that are of common interest to you both. These are the items that will help you propel the business relationship to the next level. Recently, I stopped by a computer store to have my PC worked on and the clerk proved to be anything but customer-friendly. When she did finally speak to me, she told me I would need to leave my PC at the store for at least 3-5 days and that I should be prepared to have everything wiped off the computer. Her comments were not very reassuring, and as I left the store, I mulled over my decision to leave the PC with them. Within an hour, I returned to the store, picked up the PC and took it to another store where I received the personal service I was looking for. It’s ironic to think that the first computer store probably would have done the same repair as the second store, yet the second store got my business (and all my future business) based strictly on the personal service of the clerk. Have we stopped to think for a moment about the perception we give people when we talk to them? Next time you enter into a conversation with a potential or new customer, think about how the other person sees you. Do they see you as an expert — a professional who can provide them with the confidence they need? In today’s business climate, we all have numerous competitors who can provide service or products similar to ours. The difference lies in the confidence we provide the customer. Before you begin the next conversation, think “confidence” — not just in what you plan and say, but in how the other person will perceive you. Always start off a sales call by covering three things: 1. Gain a clear understanding of the amount of time the call will take. 2. Make sure the customer knows what the objective of the call is. 3. Relate the reason for the current sales call to the previous sales call you had with the person, or to information you may have sent them. Connecting the current sales call to something previous gives the customer the comfort of knowing you remember fully everything that may have already occurred. This also gives the customer the comfort of knowing you respect their time and that whatever is decided in this current meeting will be acted upon by you. OK, so you’ve never heard that line, but wouldn’t it be great to hear it? A price can never be too high –it’s only too high when we haven’t taken the time to find out what the true benefits are of the item we’re selling. Remember, there is no such thing as “too expensive.” There is only the belief that the potential gain from something is not worth the cost. This principle explains why one person might be willing to pay only $10,000 for a car, while the car might be worth $100,000 to another person. The difference? The perceived benefit. Next time you’re about to buy or sell something, think in terms of the benefits the customer can gain from using it and not the price you’re asking. When it comes right down to it, there is nothing that is too expensive — it only lacks sufficient benefits to warrant the price. For salespeople who have retained customers for a period of years, it’s special to recognize them and their relationship with you. It’s also a great way for your customers to realize how much you think of them and a great way for you to take the relationship to an even higher level through this personalized type of communication. Next time you’re about to give someone your business card, take a moment to personalize it. If you take a moment to jot on the card your cell number, a home phone number, or some other piece of information that is not already on the card, you will suddenly make the person to whom you’re talking feel very special. Chances are the person will never call you on the hand-written phone numbers, but simply writing them on the card gives the person the feeling that you are placing them in high regard compared with others who you meet. I’m constantly amazed at the number of times I run across salespeople who clearly don’t believe what they’re saying. It is easy to spot in the person’s face and body language. They take on a whole host of non-verbals, ranging from non-expressive smiles with tight lips to eyes that lack any sense of direction. When we’re selling to a customer in person or on the phone, we have to make sure our entire face reflects the enthusiasm and excitement of our words. Why would we expect a person to buy from us if we’re not connected to and excited about what we’re selling? Don’t forget to use “umbrella questions” on every sales call. Umbrella questions are questions that work in any selling situation and are designed to provide you with additional information. Examples of umbrella questions include: Why? Tell me more. Share with me another example. Explain further. Are there some other examples you could share with me? You get the idea — umbrella questions are ones that get the customer talking more about what they’re looking for. On your next sales call, challenge yourself to ask at least 5 umbrella questions. Do you know what goals your customers have? Just think how much more effective you could be if you knew the goals of the person to whom you are selling. Find out what their personal and business goals are for the current and upcoming year by asking questions and listening to their answers. In addition, let them know that you have set goals for yourself. Explain your belief that it is essential for you to help your customers achieve their goals in order for you to achieve your own. At certain times in the year, most people are working hard to make their numbers. Yet, at the same time, many have no idea how long it takes to turn a prospect into a profitable customer. Creating a “prospecting timeline” can help benchmark past experiences and streamline future ones. Begin this process by examining a few recent customers, and then break down the key activities you went through. Your goal should be to determine the specific activities that were the most time consuming, and then figure out a way to shorten the time spent on that particular step. Most people are amazed to find that a couple of activities take the majority of time. By knowing this, they can work to alter their selling process. Plan now so the upcoming year will be your best year ever! When we near the holidays, it’s a great time to begin preparing your schedule for making phone calls to people to whom you rarely talk. There’s no better opportunity than during the holidays to call someone you haven’t spoken to recently and wish them a great Thanksgiving, Christmas, etc. If you make 5 calls per day, just think of how many people you can network with by the time December 31 rolls around? Often the holiday period becomes a very difficult time to sell when you’re in a business-to-business environment. If this is the case for you, use the holiday period to sell yourself and your knowledge. Send your customers information about your industry, the economy or other points of interest. Although they may not read the information, they will notice that you took the time to send it to them. Use these months to deepen your relationship with your customers. When business gets back to normal after the first of the year, you’ll have new things to ask them about and, more importantly, you’ll be viewed as a salesperson who is interested in more than just money. How much do you know about your customer’s customer? It doesn’t matter if you sell B2B or B2C, the question still demands an answer. I work with too many salespeople who, when asked this question, have only a shallow answer. Take the time to find out all you can about what motivates your customer’s customers. Spend time with them, talk to them, and, most of all, get to know what drives their decision-making process. When you can identify this information, you can then provide your customer with even better service. Start the New Year off right by developing the habit of recording the questions you ask on a sales call. Create a complete list of all the questions you ask to open a conversation, explore facts, close a sale, etc. Along with recording the questions, make a note of the type of responses you receive. Within a few months, you will not only have documented your questioning skills, but also developed your own personal list of questions you feel very comfortable asking. There is always something new you can learn about your customers, whether they are newly acquired or long-term accounts. Use each sales call as an opportunity to be teachable. It’s amazing how customers change! Unless you keep up-to-date knowledge about them, you will soon find they’ve changed and you haven’t. After each sales call, ask yourself what you learned about the customer and, of course, make sure you record it in your customer profile. At the end of each day and each week, compare your accomplishments to your overall sales goal. If you achieved the volume you needed to hit your goal, congratulate yourself! If you didn’t, identify at least one thing that did go right and might help you achieve your goal in time. Always find something positive to end the day with. Before you leave, don’t forget to set up the next day or week! The last thing you want to do is use those very productive first minutes of the day doing anything but selling. Looking for a reason to contact a customer or a prospect? Search their name on Google.com to see if there are any listings for them. You’ll be astonished at what you can find concerning your customers/prospects or others with their same name. Regardless of the outcome, the search should give you some interesting antidotes you can use on the next contact. When that contact is made, the customer/prospect will be amazed you took the time to do the search, and if you do find something in reference to them, you’ll have the perfect subject to talk about. Never end a sales call without having agreed with your customer on something, even if it’s not the close of a sale. The objective of coming to an agreement, no matter how small it might be, is to demonstrate to the customer that you’re able to move the sale forward. If possible, gain agreement on one particular aspect of the sale and use this as a building block for the next time you meet. However, if you can’t see eye to eye on a particular aspect, you may at least be able to concur on the items you intend to follow up on or a time to get together again. The important thing is that you agree on something and use whatever it is as a “next step” toward a future sales call. In each day, make time to not do any type of selling. Rather, use that time to reflect upon recent sales contacts and identify at least one thing you did well in each. Think of the questions you asked, the body language you used, and the information you shared. After you’ve pinpointed the best of the best, take the time to plan how you can do that same activity in every other sales call you have. Every time you make a sales presentation, always be thinking about what the add-on sales may be. If you wait to think about this until after you close (as is commonly done), you tend to be too rushed and forget the whole add-on process. Thinking about these sales during the presentation will enable you to be ready when the time comes to ask for them. In addition, many times, the suggestive sell of the add-ons can help close the sale of the first item. By using this technique, you increase the potential for the total sale, and decrease the amount of time you would use if you were to sell each item independently. The customer should never hear your entire sales presentation! If you have to deliver the whole thing to make a sale, you either haven’t developed a very good presentation or you shouldn’t be selling. The purpose of the sales presentation is to assist you, the salesperson. It is not so you can assist the fancy, glossy sales materials or the super-slick PowerPoint presentation. Great salespeople never have to deliver their entire presentation because they’ve taken the time to over-prepare. They’ve built sales materials around any type of concern they may face and are ready to deal with an objection should it arise. For the vast number of industries in which salespeople are involved, this simple one-year reading commitment can quickly make you an authority. Frequently, salespeople think the way to control the amount of time needed for a sale with their customers is by offering them a special deal if they buy now. When this is done, the salesperson is usually only giving away profit, while thinking he’s speeding up a sale. We leverage time best by selling to the customer’s time parameters, not our own. When we sell to their parameters, we are selling at a higher value and a higher profit. With many sales, it appears there is only one person involved in the decision-making process. Yet, more times than not, another person is behind the scenes influencing the decision. When you make your sales call, always assume there is an influencer and expect to deal with him or her. To find out who that influencer is, use probing questions with the customer such as: Who else in your organization is typically involved in decisions such as this? When decisions like this have been made in the past, what are some of the things others have said? Where does a decision like this rank in terms of other decisions you typically make? When faced with resistance to price, offer the customer an example of where they spend considerably more money on something else. By doing so, the customer will begin to put into context the amount you’re asking them to spend with you. There are six universal questions you can ask almost anytime and anywhere in a sales presentation. They are: Who?, What?, When?, Where?, Why?, and How?. A perfect place to ask one of these is when you’re not sure where to go with the discussion and/or are afraid of losing control. The best way to make a sale is to have someone else make it for you. You do this by creating sales advocates. These are people who are so impressed with what you offer and/or the way you sell that they tell others about you even without you asking. If you haven’t obtained any sales like this, then you don’t have any sales advocates and, more importantly, your sales process and/or service may not measure up to what people expect. After people have had time to experience the product or service you’re selling, they often begin to realize benefits they weren’t expecting. Talk to your long-term customers and find out what additional benefits they’re experiencing. You may find it advantageous to use these in your future sales presentations. Block out 30 minutes a day (or 2 hours a week) to move to a quiet location with nothing but a blank piece of paper. During this time, ask yourself how you can secure more sales from your existing customers and make notes of your thoughts. Your best ideas will always come when you step back from the business long enough to examine how you can take your customer relationships to a higher level. It’s important to understand why people do business with you. Have you ever asked your customers why they chose you? Have you ever asked those who chose your competitors why they did not decide to do business with you? Find out if there’s anything about your sales process that needs to be modified. The information is free, and it may wind up being the best feedback you’ve ever received. Tilting your head slightly when you are listening to someone speak communicates that you are giving them your undivided attention. It’s amazing how this simple type of body language can convey a powerful message! It may seem that 33 tips is excessive, but honestly, if we are committed to our sales motivation, we will constantly be on the look out for even more sales tips! Begin today to incorporate at least some of the above tips to your sales approach, never forgetting that the sales professionals who excel the most are those who never stop learning the best ways to excel. Mark Hunter, The Sales Hunter, is a consultative selling expert committed to helping individuals and companies identify better prospects, close more sales, and profitably build more long-term customer relationships. To find out more, visit www.TheSalesHunter.com. The #1 Blunder: why e-mails get deleted before they are ever opened? The 8 ways to get your e-mail read from start to finish? 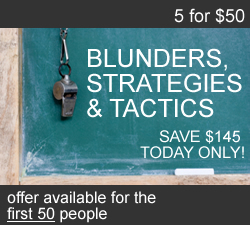 The 4 reasons why clients and prospects delay, procrastinate and put off buying decisions? The 6 strategies to create urgency and get your client to act? Our eTraining is one of the absolute best ways to get ongoing, expert advice from expert trainers like: Gil Cargill, Tim Wackel, Jim Domanski, Michael Nick, and many more. Their proven tips and tactics are utilized by many of the largest companies, and now with eTraining they’re available so smaller sales teams and even individuals can take advantage of them. *Limit 1 trial per user. * REQUIRED in order to receive trial. Note: Other sales trainers will be excluded from trial. Sign-up for our free e-newsletter below and receive via email a complimentary audio download "Top 10 Voice Mail Blunders." This is an opt-in only newsletter, and we will not sell or distribute any of your information.